Kansas Secretary of State Kris Kobach is the reigning poster child of voter suppression. He implemented some of the strictest voter ID legislation in the nation in Kansas and fought to remove nearly 20,000 properly registered voters from the state's voter rolls. 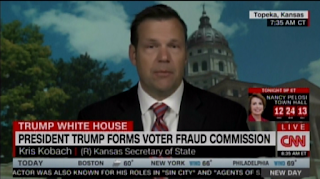 Kobach regularly makes claims about the extent of voter fraud in the United States that several nonpartisan studies have showed are unsubstantiated. He applauded, loudly, when Trump falsely claimed that 3-5 million people had voted illegally last November -- most of them in California. Kobach applauded that lie because Kobach was Trump's source for that lie. 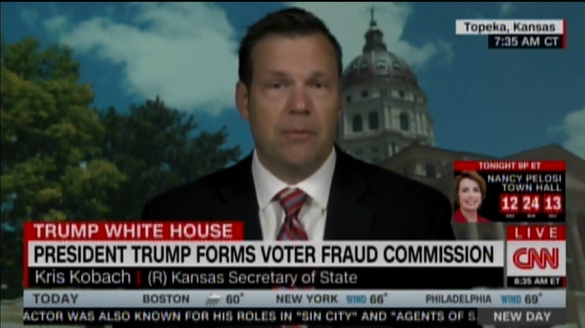 So, naturally, Trump appoints Kobach to his voting fraud commission, because if you have a conclusion in search of evidence, Kobach is your man. He was recently fined $1,000 for "patently misleading representations to the court” about the memo Kobach was photographed taking into a Nov. 20 meeting with Trump -- helpful suggestions about how to implement nationwide voter suppression laws -- as well as another document proposing changes to the National Voter Registration Act, better known as the motor-voter law. He's a first-class liar, in other words, a liar in search of partisan advantage via voter suppression. What's his so-called voter fraud commission up to? They've demanded "sweeping and unprecedented" data from all 50 states, insisting that every state "turn over voter registration data, including sensitive information like partial Social Security numbers, party affiliation and military status." The Republican Secretary of State of Mississippi was blunter: “They can go jump in the Gulf of Mexico,” Secretary of State Delbert Hosemann, said. “Mississippi residents should celebrate Independence Day and our State's right to protect the privacy of our citizens by conducting our own electoral process." 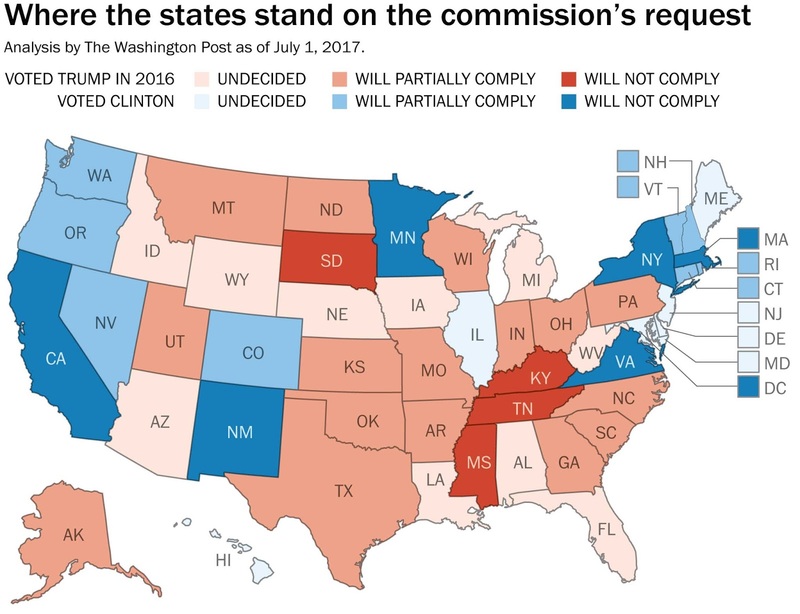 Both Republican and Democrat officials in charge of election data in about half the states have already refused to comply or will only supply data that is already publicly available. They're smart, and thank God for that! “I will not provide sensitive voter information to a commission that has already inaccurately passed judgment that millions of Californians voted illegally,” said California Secretary of State Alex Padilla, referring to Kobach's claim that millions of illegal immigrants had voted in California. What about North Carolina? Kim Strach, the executive director of the North Carolina State Board of Elections, announced that she would comply by handing over only “publicly available data as already required under state law." Meanwhile, Trump is tweeting that the balky states must have something to hide. No, they have something to protect, namely fair and free elections.